Strong vine growth ensuring very good fruit cover. 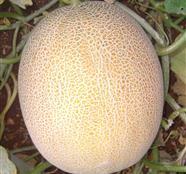 The elongated oval fruits, 2-3 Kg in weight, have a medium netting. Having a small seed cavity, Anna F1 is a good shipper. High yielder variety with uniform produce. Small seed cavity. Good shipper.